T-Pieces and 5-Way connectors are used to create drops for spurs in the backbone. Use this backbone extender to join 2 backbone cables together. A terminator is required at each extreme end of the backbone. 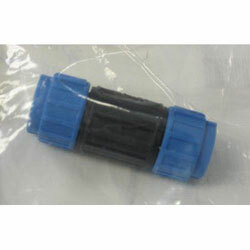 Use blanking plugs to protect any empty spur sockets from moisture and corrosion.